On Tuesdays for the next five months, beginning yesterday, I will be getting my weekly delivery of farm grown vegetables, fruits and eggs from Chubby Bunny Farms via my subscription to Chubby Bunny NYC CSA. As a supporter of community supported agriculture and locavore chef, I love getting a box of farm food every week. I but can never really be sure what will arrive in my box of fruits and veggies – although I do know for sure that I will be getting 6 organic, free range eggs with bright orange yolks (Dan and Tracy, the Chubby Bunny Farmers, feed their chickens grass, bugs, kelp seaweed and organic grain which helps make for a very nutritious egg -- check out the health notes below). When I have time on my hands, I make some elaborate meals always keeping the focus on the fresh ingredients with relatively simple recipes. This week, I was only able to enjoy a quick and easy meal before hopping on a plane to West Palm Beach for a long weekend with my husband and his work colleagues. Before leaving for the airport, I made a super simple, yet delicious, sautéed spinach with garlic and nutmeg with two Sunnyside up fried eggs followed by a bowls of locally-grown strawberries with a hint of granulated sugar to bring out the natural sweetness. The secret to this recipe is the generous amount of ground nutmeg – I learned this tip for making delicious sautéed spinach from Michael Lamonico in early 2001 when I had dinner at his Wild Blue Restaurant on top of the World Trade Center. Try it! Fill a large pot with cold water and rinse sand and dirt from the spinach. Remove thick stems and dry leaves on paper towels to remove excess water. Mince garlic and grate nutmeg and set aside. Heat a large sauté pan over medium high heat, add olive oil and sauté garlic for 45 seconds, reduce heat to medium and add spinach in batches to wilt, stirring to incorporate raw leaves with wilted leaves. When all the leaves are wilted, add the nutmeg, salt and pepper and stir. Serve. Melt 1 tablespoon of butter in an 8-inch non-stick skillet over medium heat. Break open eggs into the pan and reduce heat to low. Cook slowly until the egg whites are completely set and the yolks begins to thicken, but are not hard. 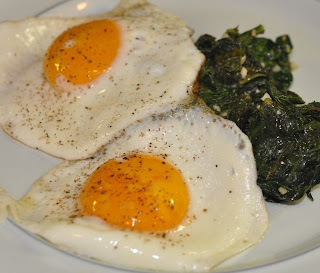 Serve eggs over cooked spinach. According to Mother Earth News’ egg testing project in 2007 where they compared eggs raised on 14 different farms with supermarket eggs the study revealed that the free-range eggs have a higher vitamin content and ... 1/3 less cholesterol, 1/4 less saturated fat, 2/3 more vitamin A, 2 times more omega-3 fatty acids, 3 times more vitamin E and 7 times more beta carotene!!! Aren't local eggs so much better than the store bought alternatives? I remember the first time I got local eggs, I couldn't get over how yellow and solid the yolks were, and that was before I even tasted them! I love simple sauteed spinach, but have never thought to put nutmeg in it, I'm going to have to try that, thanks! 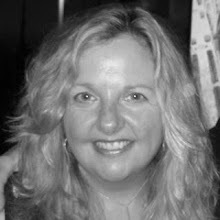 Jennifer -- Love your blog name -- I'll check it out. Experiment with the nutmeg starting off with a generous pinch and adding more as you taste it. Bon Appetit!